The wife of transitional President Joseph Kabila praises her husband at a rally in the east of the Congo. Thirty-five-year-old Joseph Kabila, who hails from the eastern South-Kivu region, did not campaign himself during the second round. He cited security concerns for not campaigning after deadly clashes followed first round results. He also refused to speak to a group of foreign journalists who went to the presidency to interview him, but he did agree to speak with several handpicked Congolese journalists. The interview aired on Congolese television Friday night. Speaking of himself in the third person, he said he would no longer tolerate what he called provocations to pull down the DRC. He said the time of chaos and confusion has passed. He said he is the candidate to stop all stupidity. His opponent, 44-year-old Jean-Pierre Bemba, was born in the northern Equateur province. He also has songs praising him. This was his explanation to foreign and Congolese journalists invited to his offices on why he is the better candidate. "I think because I know Congo very well. I know each town, each square meter of this country, because I traveled, by plane, by boat, by vehicle, jeep, helicopter, to meet the people of Congo during the rebellion time, even during the transition time," he said. "I lived also their conditions, how they live, mostly during the rebellion time. I understand their problems, what they live every day, in terms of health, in terms of education, in terms of employment, in terms of security. I am ready to give a solution, a concrete solution, to those different problems for the people of Congo." Both candidates have spent lots of time abroad - Vice President Bemba studying in Belgium, while Mr. Kabila got training and education in Tanzania, Uganda and China. Both have famous fathers. 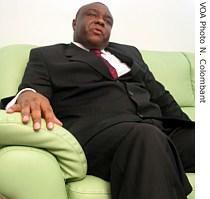 Bemba's father was one of the richest businessmen under former dictator Mobutu Sese Seko. 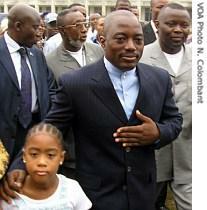 Mr. Kabila's father was the late coup leader Laurent Desire Kabila. After his father was assassinated, possibly over a botched diamond deal, he was installed as president by the military at the young age of 29. Unlike his father, though, he succeeded in implementing peace deals, and pushing out armies from half a dozen neighboring countries. But Mr. Kabila's opponents have accused him of not being the son of Laurent Desire Kabila and not even being Congolese, but rather a handy successor for a clique of corrupt cadres. Mr. Kabila has repeatedly denied this, and says no one is more Congolese than he is. An independent journalist, Luc Roger Mbala, says this discussion is misguided, even if it did dominate campaign debates at a popular level. "Until now, nobody showed us that Kabila is not the son of Laurent Desire Kabila and another thing I can say, we have many, many people who came from foreign countries," he said. "And we have a country of what you call in French, immigration country, like in the United States. The main problem is to see someone who can lead this country with the good materials, democratic materials." 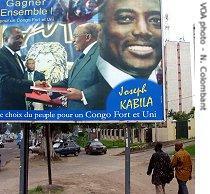 In the first round Mr. Kabila fared very well in the east, while Bemba did better in the west. Voting was peaceful, but second round campaigning was marked by recurrent violence and acts of intimidation. A nationally televised debate between the two candidates was supposed to take place in the final hours of the campaign, but to the dismay of many Congolese, it was cancelled due to security concerns.